The third batch of more than 300 pilgrims on Sunday arrived in Nazareth to begin the 11-day pilgrimage to the holy land via the Ben Gurion International Airport in Tel Aviv, Israel. 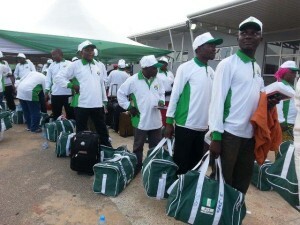 A correspondent of the News Agency of Nigeria (NAN) on the trip, reports that Anur Air, a Turkish airline, transported the contingent comprised mainly Plateau indigenes sponsored by the state government. A breakdown of the figure showed that 295 of the pilgrims were from Plateau, 14 self-sponsored, and eight medical personnel. The list also include eight others comprising security officers and media as well as four staffers of the Nigerian Christian Pilgrims Commission (NCPC), organisers of the programme. However, the head of the medical team, Mr Dominic Ogbeche, told NAN that seven intending pilgrims were dropped at the Nnamdi Azikiwe International Airport, Abuja, after undergoing medical screening. Ogbeche said they were advised against embarking on the rigorous spiritual exercise due to their high blood pressure which failed to drop as expected, even after the administration of medication on them. The handbook educates the pilgrim on the entire the operation and the holy sites to be visited. Meanwhile, the pilgrims on arrival, expressed joy and excitement at being opportuned to visit the holy land, describing it “a life time experience’’. More importantly, they said they look forward to having a spiritual encounter with God that would impact positively on every aspect of their lives. Mrs Ladi Asanga, a Nurse from Plateau, expressed her joy at being able to visit the “City of David’’ that she always reads about in the Bible. She said that she was full of great expectations as the events unfold over the next 11 days. Similarly, Dr Joe Onyekwelu, a retired Senior Lecturer from the University of Nigeria, Nsukka (UNN), said that his yearning and aspiration in life had been to have the privilege of visiting Israel. Onyekwelu, a music teacher and author, said : “I have composed church songs about Jerusalem, Bethlehem and Judah relating to Jesus’ birth, before being able to visit the holy land. He advised other pilgrims to use this experience to do something for God. Meanwhile, NAN learnt that no fewer than 4,500 pilgrims have successfully performed the 2015 pilgrimage under the “main pilgrimage’’ segment which started on Oct. 17. Other segments organised earlier in the course of the year were the Easter, Youth/Leadership and Family pilgrimages.